As it happened, the cookies were delicious! The original recipe called for a cup of shortening, but I substituted a cup (2 sticks) of unsalted butter. To keep the cookies puffy, I used very cool butter which I whipped with the paddle of the stand mixer until it was creamy. I also beat the eggs lightly with a fork and stirred them in gently tablespoon by tablespoon. That is, I used the technique from The Ultimate Chocolate Chip Cookie recipe which helps keep the cookie batter from holding too much air. The batter was interesting. Without the sugar, it was very smooth and rather soft. I chilled it for a few hours and it thickened so that by the time I was ready to use it, it was like regular chocolate chip cookie dough. As for the cookies, they were extremely tasty and I loved the flavor of the maple syrup mixed with the honey (and butter). I’m really glad I substituted butter for the shortening. For those of you wondering what the texture was like, the cookies were cakey but a tight-crumbed type of cake — very dense. So if you happen to love really moist, cakey, dense cookies, these are for you. I actually prefer crunchy cookies, but I enjoyed the flavor of the cookies quite a bit. One last note. I was wondering why the original recipe didn’t include pecans since it appeared to be kind of an Autumn themed cookie. I added nuts to a few, and now I know why. Crunchy nuts just don’t go well with the cakey texture. 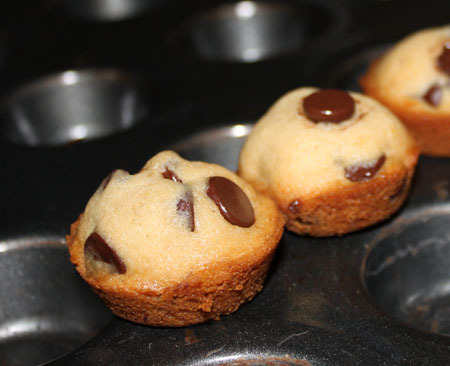 UPDATE: Later in the day I tried baking the dough in mini muffin tins and loved the results! While the cookies were fine as chocolate chip, their dense and cakey texture worked perfectly as mini muffin shaped cookies. I tried these – they are great! I made them as mini-muffins. I used butter. Also, half all-purpose flour and half whole wheat flour. I only have a hand-held mixer, so no paddle usage. I didn’t chill before baking, my batter seemed fine and I figured the muffin tin would eliminate any spreading issue. Really delicious, nice texture. I will try them again and experiment with using some spices (cinnamon, chai spices) and maybe some candied ginger pieces. I love having a recipe that is so good without white or brown sugar! Awesome, thanks so much! They look so cute. 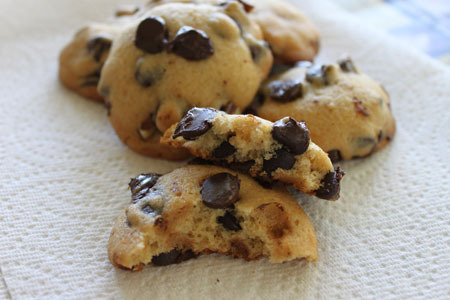 I always love chocolate chips in any kind of recipe. I think it is more yummier if you put some cream cheese frosting on the top of the cup cake. chocolate and cream frosting is delicious. wow a healthy cookie/muffin? they look really adorable. and delicious! nothing can substitute butter. really. this cake sounds like it packs a whole lotta flavour. thanks for sharing! Darn it! I wasn’t going to bake cookies this weekend and I just made these on a whim. Just a half batch. They are good for cakey cookies. The flavor is great. I wish I had a mini muffin pan. The mini-muffins look like a much better idea than cakey cc cookies. I knew from the first photo the texture was not for me. I’ll save the recipe for future use and maybe change the maple syrup ratio to try agave instead of honey. Fun, different, tasty, cute, what’s not to like? I have made ccc’s with honey and with maple, but never together. I have some maple syrup and honey left over from making pumpkin butter today, a new mini muffin tin, and chocolate chips in the freezer…this recipe is sounding better all the time. 🙂 These treats are on my to-do list for this weekend now. Now I have a craving for cookies. The little muffins are just so cute.